Post-event research from AIBTM 2012 shows that 80% of trade buyers are likely to attend the show when it moves to Chicago in 2013. AIBTM will alternate between Chicago and Orlando from next year, after spending two years in Baltimore. Organiser Reed Travel Exhibitions has now conducted an independent survey of 6,000 buyers and suppliers within the IBTM global events portfolio database to identify trends for the US as a destination for a trade show for the meetings and events industry. Additional post show research undertaken to find out the reactions to AIBTM 2012 and the move of the event to Chicago identified that 80% of trade buyers are likely to attend AIBTM 2013 and 92% would recommend the event to a colleague. 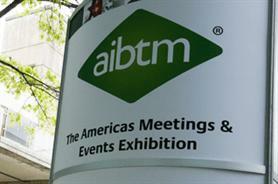 Meanwhile, of hosted buyers who attended AIBTM 2012, 90% said they are likely to return in 2013 to Chicago. 93% of attendees expected to place business as a result of their attendance and 97% felt that the pre-scheduled appointment system matched their business requirements and is now an important factor of AIBTM. IBTM portfolio director Craig Moyes said that "delivering quality hosted buyers remains the key to our success". AIBTM 2013 will take place at McCormick Place, Chicago from 11 June to 13 June 2013 and will be hosted by Choose Chicago.